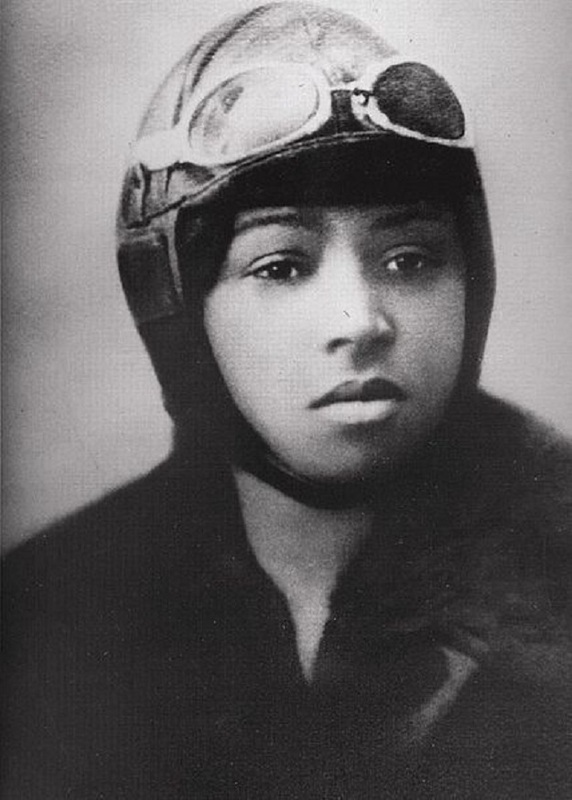 As a black woman, pioneer aviator Elizabeth Coleman overcame two career obstacles before dying in a flying accidentt on April 30, 1926. Coleman—always known as Bessie—was born into a large family of Texas cotton farmers in 1892. She joined the great migration north in 1915, settling in Chicago. Her first job was as a manicurist. Coleman was intrigued by stories of combat flying during World War I. Yet when the war ended, no American flight school would accept her. She had to go abroad to achieve her dream. She learned French, saved her money, and got financial help from Defender publisher Robert S. Abbott and other businessmen. She went to France and earned her pilot’s license. Finally, in 1921, Bessie Coleman returned to the U.S. as the country’s first female African-American flier. Commercial aviation was in its infancy. Coleman could become either a mail pilot or a stunt flier. Both were dangerous jobs, but stunt flying paid better. Coleman was young, attractive, and extroverted. Performing appealed to her. She joined the circuit of air thrill shows. Now her gender and race worked to her advantage, giving her added publicity value. Back in Chicago, her friends at the Defender printed detailed accounts of her many triumphs. 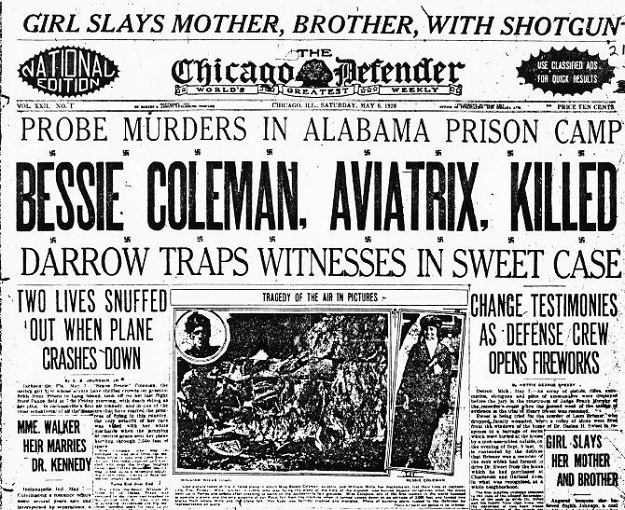 On April 30, 1926, Coleman was in Jacksonville, Florida. An air show was scheduled for the next day. With her mechanic at the controls of her open plane, Coleman took off to scout out the area. Coleman wasn’t strapped in. She wanted more freedom to see over the edge of the plane. About ten minutes into the flight, the plane suddenly went into a spin. Coleman was thrown from the cockpit and fell to her death. The plane crashed, killing the mechanic. As it turned out, the cause of the accident was dreadfully simple–a loose wrench had fallen into the gears and jammed them. The air show was cancelled. Coleman’s body was returned to Chicago, where more than 10,000 people filed past her coffin in Pilgrim Baptist Church. She was buried at Lincoln Cemetery in Alsip. For many years afterward, African-American pilots performed an annual fly-over of her grave. In 1995 the U.S. postal service honored Chicago’s aviation pioneer with a Black Heritage commemorative stamp. And today one of the streets at O’Hare Airport is named Bessie Coleman Drive.